It's always fun to do this when the Blackhawks have lost every game. That's why they pay me the big bucks! Andrew Shaw and Jimmy Hayes - It's not a good sign when two recent call ups from Rockford are outshining everyone else. But let's not take away from what the two kids have done here. Hayes has shown a physicality and IQ of a guy completely in tune with his game. He's a big body up front, which the Hawks simply don't have. He's got good instincts, and has earned a larger chunk of time up here. Shaw has displayed a screw loose, which in hockey can be a good thing. Topping off the amount of aggressiveness the Hawks have, a supply that was too low for comfort. Shaw isn't afraid to get his nose dirty, is a hitter, and actually has a decent pair of hands on him. If he keeps this up, he may find himself a permanent fixture on the fourth line. Over The Line, Mark It Zero! Nick Leddy and Niklas Hjalmarsson - Though they had a bounce back game against Detroit, they still gave up a goal in the same situation they've struggled with all year, a goalmouth scramble. These two just watch as anyone and everyone gets multiple whacks at a puck that Corey Crawford can't find. They aren't tying up sticks or knocking people down, and neither may be capable of the latter. The Hawks biggest weakness right now, and it's looking more nad more like it'll have to be solved with someone from outside the organization. Sam Fels is the proprietor of The Committed Indian, an unofficial program for the Blackhawks. You may have seen him hocking the magazine outside the United Center at Gate 3. The program is also available for purchase online. 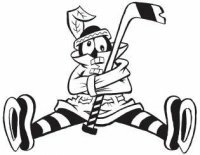 Fels is a lifelong 'Hawks fan and he also writes for Second City Hockey .